For years I did my column for the HI PIERS Newsletter. Now I'm doing it irregularly for the HI PIERS Page. No, I'm still not online myself, and if I ever do go online, it will likely be anonymously, so that I can surf the net without being bugged by those who feel they have better uses for my attention than I do. If that sounds insulting - well, I'm sure you folk reading this would never ask me to answer eighteen complicated questions by Friday so you can make an A on your school paper, or petition me to attend your friend's birthday party in a distant state, or ask for money because you want to become a millionaire. But I think you know that there are those who would, if they just had ready access to me. So I hope you understand why I prefer simply to avoid such contacts to the extent feasible. The past month or so, as I write this, has been personally eventful in minor ways. For example, I was riding my recumbent bicycle, the one that feels like a traveling deck chair - I love it - when I felt a fly or something biting my right elbow. So I tried to rub it off against my shirt - and suddenly the ground was coming at me. I conjecture in retrospect that I jogged the handlebars so that the front wheel jerked right, thus throwing me off balance to the left, and I crashed. I picked myself up, and my left elbow and left knee had been scraped. The fall was only from about two feet high, but my forward motion was maybe ten miles an hour, against the rough asphalt-and-stones drive; blood was flowing. I had several other scrapes, but those were the worst. I dragged myself on home, and my wife got busy with hydrogen peroxide and bandages and repaired me somewhat. This is what wives are for, among other things. The two inch diameter knee gouge was the worst, resembling red tomato pizza with hot sauce; when bandaged it came to resemble white cheese pizza with mustard. So after the first couple of days I left the bandage off, and let a scab form, and now after most of a month it's healing pretty well from the outside edge inward. All perfectly routine, except for two things. The first is my age: I'm not twelve, when you're supposed to scrape knees, I'm 63, way too old for such fun. (I had a letter once from a young woman who said that when she learned my age, it ruined her crush on me. Sigh.) The second was my series of jogs. You see, I exercise for my health, not for fun; it's not just accident that I am lean and fit at my age, maintaining my college weight and musculature. I've tried various things over the years, and now use hand weights, a rowing machine, and archery for my arms. For my legs and heart/lung fitness I ride bicycles and jog. That is, I run out three mornings a week, just before dawn, to fetch in the newspapers. That combines exercise with usefulness. My jogs are not of the caliber I had fifteen years ago; I'm older and slower, and run about 1.6 miles instead of 3 miles. That's why I call them jogs; they don't quite achieve the 8 minutes per mile velocity that qualifies as running, and they are interrupted by various things along the way, such as feeding the little magnolia tree some nitrogen, opening our front gate, and collecting the newspapers from their boxes. But I do time them, and rejoice when I have a good one. Over the warm summer any jog completed in under 15 minutes was excellent; my record jog was 14:36. But at this time I had a wonderful streak going, having broken my record three times and gone nine consecutive jogs in under 15 minutes. I wanted to complete it with a tenth good one, before the inevitable slump back to mediocrity. And here was this scraped and bandaged knee. Was this going to ruin the series? Maybe not, because there didn't seem to be any internal damage, just lost skin. I tried jogging a third of a mile, to see how my knee took it - and there was no trouble at all. So the jog was on, on schedule. But I remained quite concerned, because though my running felt all right, it might not actually be so for the full distance; I might lose steam, or develop a pain, or simply be slow. Such things happen to senior citizens with scraped knees. So I was really up for the effort, wanting to come in under 15 minutes one more time if I possibly could. The temperature was 65°F, the coolest of the summer, which should help; I had been running well despite morning temperatures as high as 76°. I started out, and it seemed good. I continued, and it continued well. It was too dark to read my watch, so I had to judge by feel, but I thought my pace was well under 15. It didn't fade, and I had foolish hopes of even being near record territory. I made it back to the kitchen, grabbed my glasses, and looked at the sweep hand. 14:11. I had shattered my record by 13 seconds. So my scraped knee had not slowed me at all, and I had my tenth good jog. Okay, okay, I realize that this sort of achievement isn't even a blip on the screens of you young folk out there in real life, but for me it was a bright moment. We live in the thunderstorm capital of the nation, and don't we know it! Our 40 foot TV antenna tower seems to attract lightning better than it does television signals. Summers are nervous times in this respect. We need rain, but too often it comes with fireworks. We have surge suppressers on everything, but there's only so much they can do. Over the years we've had our water pump taken out, our security alarm system nulled, our hi-fi equipment crashed, and of course our TV reception blurred. This summer we were in drought, but we did get our lightning on schedule. A measly three tenths of an inch of rain, and the strike took out our TV, our house intercom system, our upstairs air conditioning, and our garage door opener. We're still in the process of repairs. We decided to scrap the intercom and go to wall plug-in units, because they cost less and can be unplugged for storms. We got the TV antenna booster repaired. We're opening the garage door by hand. And we are replacing the air conditioning unit. The thing is, it's nine years old and they don't last forever, and it isn't the kind that was supposed to have been installed anyway. The contractor had changed it without telling us, thus sticking us with a relatively inefficient air-to-air system instead of the geothermal we expected. I hate it when folk think they know better than I do! So rather than repair it, we decided to replace it with geothermal, thus finally getting the type we had always wanted. Here is the difference: an air to air unit puts the heat of the house out into the 95° hot summer air in summer, and draws heat from the freezing cold winter air. This is inherently inefficient. A geothermal system has pipes under the ground which draw from a constant temperature of 60°-70°, so has to work less hard. So it costs about half as much to run, and if you have a heat exchanger, that cuts it farther, and in summer, it heats your hot water too. In effect you move the heat of the air into the water, so you can work in coolth but take a hot shower. So this sort of system appeals to me on both economic and environmental grounds. Well, we talked with the geothermal folk, and it turned out there were complications. There are always complications! We live on a tree farm, and trees surround our house. We love it. But a full geothermal system requires a considerable array of buried pipes. We had no clear ground. They would have to dig through tree roots galore, and maybe mess up the gopher tortoise burrow that is right near the air conditioning unit. No, I'm not sure the tortoise wanted air conditioning, but can't swear it's not so. We have many big tortoises on our property, and we like them, and would try to protect them even if they were not a legally protected species. The last thing we want to do is dig up their burrow. Neither did we want to traumatize the local trees, and in any event those roots would grow back, squeezing the pipes, making mischief. So the horizontal layout of pipes was out. However there is an alternate mode: vertical pipes. They go down rather than across. But we are a peninsula in Lake Tsoda Popka, with the water table close beneath, and this isn't best for the pipes. It seems they have to be copper, instead of the plastic of the horizontal ones, and there is electrolytic interaction that degrades the copper. Think of a battery. They can coat the copper to protect it, but even so, a large array gets complicated. What to do? Well, there's a new type of combination unit made by a local company that has a much smaller buried copper footprint, so is less trouble in that respect. It uses air to air for the more extreme differential - I don't know the exact figures, but you can see how 95° ambient temperature wouldn't make much difference to a unit radiating 250° temperature - and the underground portion for the lesser differential. Mainly, it's a more efficient system, with the heat exchanger, so can run as cheaply as a full geothermal unit. So we have ordered one of those, and we'll see. Of course as luck would have it, we're getting it just as summer ends, so it will be next year before we see it at full efficiency. But we look forward to it. I mentioned gopher tortoises. They live in the sand, digging burrows that may extend up to forty feet underground. Several tortoises may share a burrow, and other creatures, such as rabbits and rattlesnakes, may use them too. So the gopher tortoise is called The Landlord: it provides housing for a complex of other creatures, and helps make the Florida backwoods what it is. They live a long time - fifty years or so, I think - and get to be up to maybe a foot long on the shell. They come out in warm weather to graze, and ours eat only the weeds, not our lawn grass. The pattern of the shell of each one is different, so you can tell them apart if you care to take the effort. Once I was standing outside, and three different tortoises passed me on their way to the same burrow by our house. They are surprising alert, and they can move along at a good clip, lifting their shells up so that only their feet touch the hot pavement of our drive. Sure, you can pick one up and move it somewhere, but they don't seem to be any more comfortable with that than we would be if a hand came out of the sky and grabbed us. So we leave them alone, occasionally waiting for them to get off the drive so we can drive by. Well, this month my wife was coming home, and she didn't see a gopher tortoise. It was behind tufts of grass, in shadow, by a curve in the drive, and she didn't know it was there until she felt the bump. She looked back, thinking she had run over a fallen branch, and saw bright red blood, and knew what she had done. She told me in tears, and I went out to see. It was awful: the wheel must have passed right over it, breaking the shell and pressing it so hard that its intestine had popped out and split open; I could see the packed grass it had eaten. There was only one saving grace: I judged it to have been killed instantly. So I moved it to the side of the drive and returned to the house for a shovel. I dug a hole, then picked up the body - and it moved. Oh, no! It was still alive. I couldn't bury it. So my wife phoned, and learned that there was an animal hospital that took injured tortoises. We got a box and drove out, and I put the tortoise in the box, and we drove across the county to the animal hospital. I explained the situation, and they took my name and where it had happened, and we gave them the box. Yes, the tortoise was still alive. We hoped they could either save it, or put it quickly out of its misery. The woman took one look, and knew that it was hopeless. Our only comfort was that we had done what we could to see that the creature's suffering ended. On the way back I filled in the unused hole. We still have many gopher tortoises, and that wasn't one we had known personally, but the horror of its demise remains. We never want to hurt any of them, and never have, before. I got a new toy. It's a card for my computer that enables it to show a television picture. So now I can have a two inch wide mini TV screen set in the corner of my typed text. I can zoom it to full size if I want to see details, or mute it, or turn off the screen and keep only the sound. I put the news on late in the day, and a football game or tennis on the weekend, and quality programs on public TV at other times. I don't pay a lot of attention, and it doesn't slow my work, but it's fun to have it there. I do enjoy some of the wonders of technology. I continue with my archery. But I started having problems. 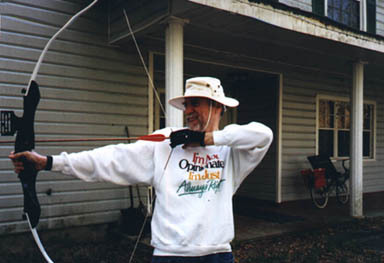 I have two bows: a right handed compound bow set at a 60 pound pull - I worked gradually up from 45 pounds - that fires arrows straight and true and fast. I normally do hit the target at 100 feet. And a left handed bow I bought from a reader that was more difficult to learn; with it I expect to hit the target at 50 feet. Well, the right handed bow started flipping my arrows out as I drew them back. It was as though an invisible hand was pushing them out. One time I tried to draw the same arrow ten times in a row, and it flipped out every time so I couldn't fire. This was frustrating as hell. What was the matter? We finally concluded that the width of the string was putting pressure on the nock of the arrow, and as the angle changed, it forced the arrow out. I finally tried waxing the string, so that it would slide rather than shove, and that helped; now only a couple of arrows out of ten will pop out. That's within tolerance. I never had that problem with the left hand bow. But with that one I had fluke misses. I would score a near bullseye, then an arrow aimed the same way would jump right and completely miss the target. When I missed four out of ten that way, I knew something was wrong. It seemed to me that if my aim were bad, I should be missing in all directions, while this was always about 18 inches to the right of where I aimed. Was it that invisible hand again? Then, belatedly, thinking about it as I was at the computer, a dim bulb flashed: I was firing with both eyes open, as it's not good to perpetually squinch one up; you simply orient on the one you need and ignore the other. But my right eye is mostly dominant. Right handed, no problem; that's the one I use. But left handed I use the left eye - and sometimes the right eye tries to pre-empt the view. So I was looking through the peepsight on the string with the left, and at the front sight with the right - and my brain integrated the two views, giving me a picture of aligned sights. But I was actually aiming about eighteen inches to the right. Mystery solved. So next time I did close my unused eye, with both bows, and my arrows were going straight and sure and true. Until I missed one fluke right. Hm. But it didn't happen again, and now I'm hitting the target every time, and as I adjust the sights, scoring more bullseyes. However, on my last session, my left bow was perfect, but my right bow missed one arrow left and one right - and both arrows vanished from the face of the earth. I fear I have hours of searching to do, for they are either completely buried in the forest floor, or hiding somewhere they couldn't possibly be. Sigh. I was contacted by a new outfit called Xlibris. This is interesting. Xlibris wants to enable anyone to publish his book on the Internet, or to put his old out-of-print books back into print via this medium. I have been looking for an alternative to the tyranny of Parnassus for a long time, because conventional publishers typically crap on the dreams of hopeful writers. Now, perhaps, Parnassus (by that I mean the literary establishment) can be bypassed. Let's say you are a hopeful writer, and you realize that your book Second Rate Effort is not exactly the Great American Novel, but you have labored over it for three years and you'd like to see it in print. You have tried sixteen publishers and gotten thirteen printed slip rejections, one lost manuscript, and two black holes - that it, they neither return your manuscript nor answer your letters of query. You have just about had it with the usual arrogance of Parnassus, because this is your dream work, and you feel it deserves at least some hint of weak evidence that someone read as much as the first page before bouncing it. But what can you do? You are a mere maggot in the toilet of Parnassus, with no power except to irritate an anonymous editor by the fact of your existence. Must your dream be forever stifled? Maybe not any more. Xlibris will, for a one time fee of $300, enable you to self publish your book on the Internet and keep it there. Anyone who wants to read it can download it for $3 or order a printed trade paperback copy for $18, and you will get a share of that money. So maybe only five people will order copies, and three of them are your friends who feel sorry for you. But your book is in print and available worldwide. Your dream has been realized, far more cheaply than you could do it any other way. And if later a regular publisher takes an interest, you can still sell it there, because you are the publisher on the Internet; you haven't given up your literary rights. Damn, I like this dream, so I may even invest in Xlibris, trying to help it happen. You can check it out at www.Xlibris.com. Meanwhile, I hope to put my World War Two novel Volk on there, as well as where it is now, at www.Pulpless.com, to see how it works. Florida gets lots of rain, but this summer we in north central Florida were in a drought. Then at last a heavy band of rain crossed the state, and in the course of a day and a half dumped fourteen inches of rain on Gulfport, Florida - where we used to live. Parts of the Tampa Bay area look lakes with houses sticking out of the surface. But only three inches here. We could have used that extra rain. Ever thus. I have ongoing semi legal hassles in New Yuck, Pencil Vania, and Cauliflower, none of them yet quite concluded. So I'll report as they do conclude. For now you may assume that I have the right of all cases; I just don't let anyone walk over me or mine, and I do have the will and means to fight them through, ogre fashion. JD Gibson asks what happened to Chlorine and Nimby, after Yon Ill Wind. Since the demon Xanth won his bet, he instantly rose up, made Chlorine lovely and smart again, and carried her off to the nameless Castle where he assumed human form and they celebrated in a manner the adult Conspiracy prevents me from describing. Wasn't that obvious in the novel? Valerie R Levan says that my books got her interested in reading and she became an A student, for which she thanks me. I love having that effect on young women. BlueStile1 inquires about a rumor that I wrote a book called Tangled in the Tree. I haven't written one with such a title, but maybe he's thinking of Shade of the Tree, or With a Tangled Skein. I once was going to write one about my daughters titled Tanglehair Tales; an editor expressed interest, but never followed up with a contract. Eric A Siegman inquires how many of my novels or short stories never made it to print. Excluding books currently being marketed, two novels never found publishers: The Unstilled Earth, which was my first novel in college and not good enough to publish, and Volk. Dozens of stories; I was able to sell only about one in four, which is why I graduated to novels. Some I sneaked into print despite editorial rejection, in my collections; that was the case with "Gone to the Dogs" and "The Toaster," and "Revise and Invent." Richard Travis says that the 3D technique described in Demons Don't Dream could and should have been used in the Companions of Xanth game. That's hardly the half of it. When I saw an early version of the game, I sent a letter of comment and suggestions, how to make it more accessible to readers who weren't computer buffs. I mean that was the idea of it; Dug didn't like computer games, but learned to like this one. The game proprietors called me ignorant and ignored my suggestions. Even so, it was the best selling game in that company's history. Who knows how it would have done, had they been willing to listen to one who does pay attention to his market? Too bad Richard Travis was not in that company; I like his notions. Luke Hodges says he loved the game, then read the book and liked it even better. Okay, Luke; maybe you'll be pleased to know that a main character in Xanth #23, Xone of Contention, will be Edsel, Dug's friend who stole his girlfriend. They get along okay now, since Dug found a better girlfriend. Yes, Pia will be there too. HeTautsu reminds me that Crombie said his mother could read minds, when she was mundane. Well, Crombie may have lied, but more likely didn't realize that this is a talent all mundane mothers have with their children. Don't you remember your childhood, and the episode of the missing cookie? Kitty Sexton says she'll always be first in line to buy my new books. Gee - does that mean that if I see a line at a bookstore, it's okay to kiss the first girl in that line, knowing who she is? Nic Rodolph says it would be nice to have an artist make a detailed map of Xanth and areas within it. Well, the Visual Guide to Xanth does that. Doug Durkee says he's another loyal faceless fan. That's the best kind. So is Evan. So is Daniel Lee. Jamie Davis asks whether I created the dragon horse, Glyph, hippocampus, magic sniffer, chobee, firefly, hornworm, or Blatant Beaste. I draw a lot from mythology and from reader puns. In either case, sure, go ahead and use them in your story. Jamie also asks how I got DEL REY to publish my books. I knew the editor from our time in the magazines; when he became a book editor, he invited me along. Yes, sometimes it helps to have a connection, to get a good book into print. It's a different crowd at DEL REY now; I believe they do still consider first time manuscripts, but there's so much competition that your chances are small, there or anywhere. You'll just have to send in your manuscript, and see what happens. It may take many months to get a response. Mirson asks about a collaboration with many different authors I did some time ago in THIEVES WORLD. That must be a confusion; I haven't done any in that series. Amber Sunz asks about characters in the Big Top and such. She's thinking of the two Xanth gamebooks by Jody Lynn Nye, now out of print. Too bad; they are fun books, with two slews of puns. Debbi Ward in England asks about my next release. That's Faun & Games, but it won't be published in England. Check a store where they carry the American edition. Bill Cunningham likes my non-Xanth novels like Omnivore, Tatham Mound and Hope of Earth. He wonders why I didn't use the ancient Sphinx in that last. Because when analyzed, the evidence was not persuasive, and GEODYSSEY is historical, not fantasy, despite the publisher's determined mislabeling of it as fantasy. A complete discussion would be too complicated for this column, but I was reluctantly satisfied that the Sphinx was not older than its associated pyramid. Stephanie Van Herk wonders why some of my novels aren't on tape. Tape publishers are just as whimsical in their choices as book publishers, and at times seem neither to know nor care what folk really want to hear. Jamie of "Granville Rainey" invented a character named Saribeth - Sari - who is from the realm of Narnia. I read the seven Narnia fantasies to my daughter when she was young; they were good, if a bit violent in places. Sari, I can't tell whether you have a future as a writer just from a summary of your story; what counts is how you actually write it, and whether your characters come alive for the reader. Keep working at it; maybe you will be one of the few. Barbara Hewett wants to post the Xanth timeline on her Wed site. Sure, go ahead. Later we may post the updated one here, and the huge Xanth Character database. And Corellian asks how come in Ogre, ogre the gourd trades back two half souls for the Demon Fiant, when demons don't have souls? Because demons are souls. Degraded and undisciplined, because they lack bodies, but souls nonetheless. Since a demon uses its soul substance as its body, it needs another soul in order to have one. But in the real of bad dreams, they don't bother with that; they just take the whole demon. So much for this column; there'll be others at irregular intervals.